Whether you are retired Air Force or served and now classify as a veteran of the Air Force, there are rules to where, when and how you can wear the uniform and medals and ribbons on civilian clothing. Naturally the retired member is granted more frequency to wearing the uniform but only for certain occasions. A retired member of the military are granted many privileges to active military bases, stores and services, as well as receives a pension and medical / dental benefits. Typically to achieve this level of privilege, one much serve for at least 20 years, however being medically retired due to injury or illness is another way to receive similar benefits as a retired member in the military. Formal Settings - Events such as military ceremonies, funerals, weddings, memorial services, and inaugurals are all appropriate places to wear the uniform. Traveling to and from any of these functions as well as the ones listed below while in uniform is permitted however the travel while in uniform must be less that 24 hours of the event starting time. Holiday Events - There are many days where the uniform of the military retiree is appropriately worn. Holidays such as the Fourth of July, Memorial Day, and Veteran's Day on other such events as patriotic parades when military units are participating or being honored. Educational Institutions - When part of giving military instructions or responsible for military discipline the retiree may also take part and observe while in uniform. Social Events or other functions when the invitation to the event is because of the retired service member's prior service and acquaintances related to that service. A veteran is defined by a prior military service member who served honorably in any of the branches of the military and Coast Guard (Army, Navy, Air Force, Marines) as an officer of enlisted. Formal Settings - Events such as military ceremonies, funerals, weddings, memorial services, and inaugurals are all appropriate places to wear the appropriate uniform. Traveling to and from any of these functions as well as the ones listed below while in uniform is permitted however the travel while in uniform must be less that 24 hours of the event starting time. Holiday Events - There are many days where the uniform of the military retiree is appropriately worn. Holidays such as the Fourth of July, Memorial Day, and Veteran's Day on other such events as patriotic parades when military units are participating or being honored. And any other event required by law. 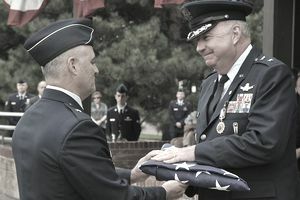 Separated Airmen (regardless of whether or not they served during a time of war) may wear the uniform from place of discharge to home, within 3 months after discharge. Public or Political Speeches - Participating in public speeches, interviews, picket lines, marches or rallies, or in any public demonstration when the Air Force sanction of the cause for which the activity is conducted may be implied. Personal or Political Gain - The MOH recipient may not further political activities, private employment, or commercial interests wearing the medal and / or the uniform. Civilian Employment - MOH recipients may not wear the medal while working in an off-duty civilian capacity. Civil or Criminal Court - The MOH recipient may not wear the medal while participating in civilian court proceedings when the conviction would bring discredit to military service. Note: Any individual wearing a US Military uniform is expected to reflect the high personal appearance standards and esprit de corps that the US Military in uniform represent. To this end, particular attention will be paid not only to the correct and military wear of uniform components, but also to the individual’s personal and physical appearance. All personnel exercising the privilege of wearing a US Military uniform will comply fully with their service's grooming and weight control standards. Air Force Instruction 36-2903 addresses the wear of Air Force uniforms by Air Force retirees and Air Force veterans.